I stopped by a Borders this afternoon and bought what will probably be the last books I ever buy in a Borders store. There’s a lot that can be said about a major bookstore chain going out of business, and little of it is optimistic. There’s a case to be made that this is bad news for publishers, writers, readers, and even other booksellers — at least in the short term. 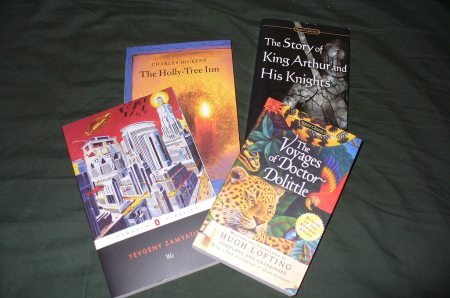 Still, I bought four books at the Borders I visited. Not out of any illusion that this would benefit anybody except the liquidators — it’s too late for that now — but because I wanted those books, and a 20% discount is better than nothing. The sad truth is that since Borders is never coming out of bankruptcy, there’s very little chance that any of the money I spent today will find its way to the publishers or authors. Admittedly, that’s a bummer. So head on out to your local Borders before it’s gone forever. If you can get a good deal on Machine of Death, I hope you’ll take advantage of it. If not, then there’s always the free PDF or the local library. And you might find us cheaper on Amazon or Barnes & Noble anyway. No one in the United States is in danger of losing access to books. The Internet makes it easier than ever for people everywhere to get their hands on books of all kinds, usually for a pretty reasonable price. But the number of people who no longer have a local bookstore is going to increase substantially when Borders closes its doors. So if you like bookstores, then I urge you to seek out whoever is selling books in your area — even if it’s only Walmart. If you don’t like the set-up or the selection, let the folks running the store know what it would take for you to shop there. And, of course, keep your eye out in case anything comes along to replace those shuttered Borders stores. In the long term, this could be an opportunity for independent bookstores to reclaim some of their old turf. If that ends up happening, we should all be ready to give them the welcome they deserve. I actually bought three books, and convinced two of my friends to buy MOD on our last visit to Borders in our town. It was a sad day indeed, but hey, three books for almost the price of one was a good deal. Sadly, both Borders where I live died in the contraction 6 months ago, when they thought they could salvage themselves. The local Barnes & Noble closed around the same time. One of those Borders had been pretty cool too, now it’s an empty, 3 story husk :(. The loss of Borders will probably be healthy for the Brick & Mortar bookstore industry in general. Borders didn’t have the world’s brightest business plan, and their selection was always just a tad substandard. My little brother texted me not an hour ago saying that the Borders in our mall is going out of business and I had to relay the sad truth that they all are. Luckily for us in New Zealand, the company which owned the local branch of Borders was bought out when they were in danger of liquidating. So, at least the massive store in the centre of our biggest city will remain, which is a massive relief, and seeing as the Whitcoulls stores which are the typical NZ ‘local bookstores’ are owned by the same company, chances are that most of those will remain too. However, I’ve visited the Borders in the states before and ours pale in comparison. I’m sorry to hear they’re going under, but hopefully someone will step in. After all, surely there’s still a strong materialistic book market. “Cheap or free books are the fuel for many a book-a-week habit that could never be supported otherwise.” Do you have a public library? It could easily support that habit. And, no one will ever lose access to books as long as the public library system is in place. If you pay taxes, you’re paying for it already, so you should use it. If your librarians don’t have what you’re looking for, they will get it for you and, if you don’t know what you want, they’ll help you decide. The world has not ended just because another profit-driven big-box store has gone under.